This an update to my original post from 4 December. 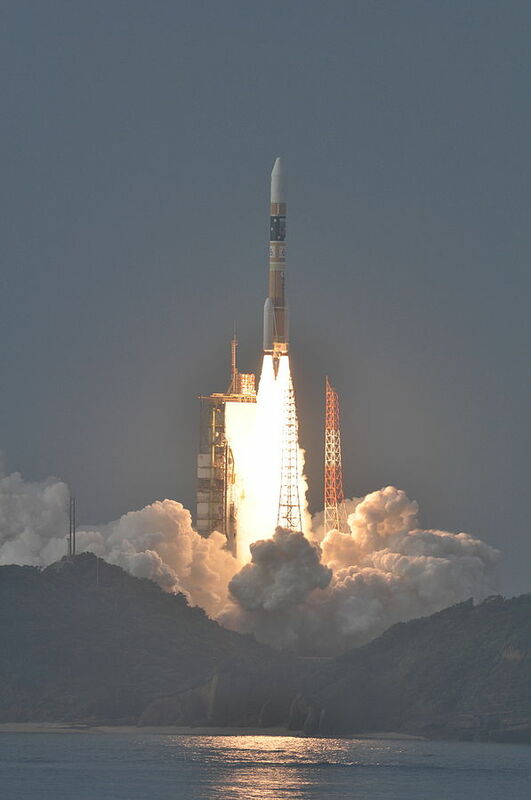 This is great achievement for the Japanese space programme and hopefully the spacecraft will provide us with many exciting discoveries about Venus. The image shown above was taken by Akatsuki in ultraviolet light on 7 December 2015, just after it went into orbit around Venus. It shows far more detail of the cloud patterns in the planet’s upper atomosphere than can be seen in visible light. 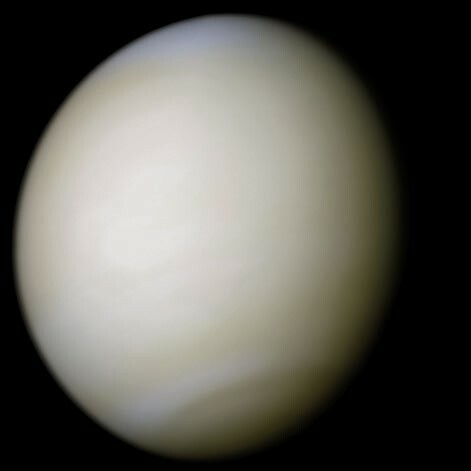 On 7 December 2010 the Japanese spacecraft Akatsuki (named after the Japanese word for dawn) arrived at Venus after a six month journey. It was only the second spacecraft launched since 1989 to visit the Earth’s sister planet and, if it had succeeded in orbiting Venus, it would have had been a tremendous boost for the Japanese space programme. Unfortunately, when it arrived at Venus its main engine failed to fire properly to slow the spacecraft down and put it into orbit, so it shot past the planet and went into orbit around the Sun. However all was not lost. 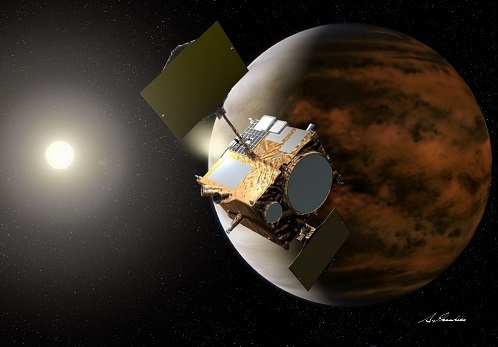 Other than the main engines, all parts of the spacecraft turned out to be fully functioning, and the Japan Aerospace Exploration Agency (JAXA) will get a second chance to get Akatsuki into orbit when it passes close to Venus on Monday 7 December. This is very unusual for spacecraft which fail to go into orbit. Normally when a major mishap like this occurs the space agency doesn’t get a second chance. How will the spacecraft get into orbit if its main engine has failed? The thrust or force provided by rocket motors is usually measured in units called newtons, usually abbreviated to N. The main engine which failed to fire had a thrust of 500 N. To get the spacecraft into orbit JAXA will need to fire 4 of the 8 small rocket motors which were only designed to finely tune the spacecraft’s position. Each of these small motors only generates 20 N thrust and they will have to fire for a total of nearly 21 minutes to slow down the spacecraft to allow it go into orbit, something they were never designed to do. It is also fortunate that, unlike most spacecraft, the small rocket motors and the faulty main engine of the spacecraft use the same fuel, a liquid called hydrazine. If this was’t the case then this rescue operation would be impossible. What will the spacecraft achieve? an infrared defector which will peer through Venus’s atmosphere to see heat radiation emitted from Venus’ surface rocks and will help researchers to spot active volcanoes, if they exist. Let’s all keep our fingers crossed for a success on December 7! Yes it is great achievement. The mission looks like it will be a great success and will tell us a good deal more than we know now about Venus. I do finf it strange how low key the reporting has been outside Japan. This is an amazing story and I am surprised it hasn’t been given more prominence in the media – Science Geek sets the standard here! A question – as Akatsuki overshot Venus and then went into orbit around the sun, and given that Venus is closer to the sun than earth, wasn’t Akatsuki damaged by orbiting close to the Sun? Or was the resulting orbit from the overshoot further away from the sun than Venus? Perhaps the overshoot could have resulted in an orbit too near to the sun for Akatsuki to survive, but in fact the overshoot resulted in an orbit that was actually further from the sun than the Venus orbit? Obviously Akatsuki came through the last five years relatively unscathed and we should be grateful for that. I look forward to what this noble spacecraft will tell us about Venus! The answer to you question is that when it overshot Venus Akatsuki went into an oval shaped orbit, part of which was closer to the Sun than Venus and part of which was further away from the Sun. The spacecraft actually got a lot hotter than it was designed to. However, the robustness and quality of the engineering has meant that the spacecraft ‘s instruments appear to have escaped unscathed. Thanks for the nice post. I’m curious about why Akatsuki was designed with a single monopropellant fuel standard in the first place. In this case, it turned out to be very good luck for the Japanese Space Program and for us all! The main engine (500 newton thrust) which failed was actually a bipropellant which used hydrazine as the fuel and mixed oxides of nitrogen as the oxidiser. The 8 small thrusters which were only intended to finely tune the spacecraft’s position were monopropellant, using the decomposition of the hydrazine to provide thrust. So even though the main engine had failed Akatsuki was still able to eventually achieve orbit by firing the thrusters for 21 minutes.